If I'd ever needed motivation for this project, you are all giving me some with your kind comments! Thanks to you all! Your roses are so pretty but did I see the word 'cutting'?? Yikes!! 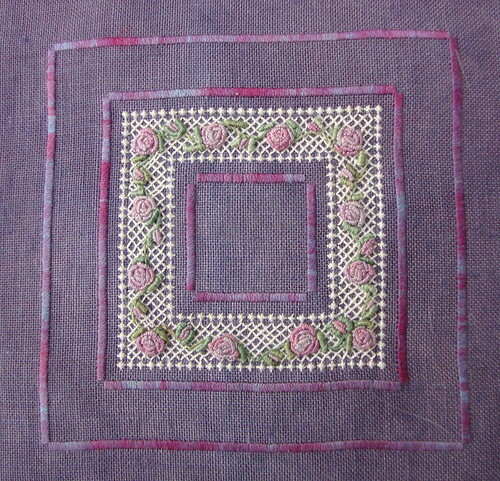 Very pretty, Veronique - I haven't seen bullion stitch roses in a long time! Can't wait to see your cutwork!! This is outstanding. Such delicate work. I would be terrified to take scissors to such a piece. I don't know how you do it. Beautiful! The roses are gorgeous! What kind of stitch is that? very nice ,really,this comment is from bergamottepatch.over-blog.com ,a visit 'd be nice ,dear old friend,just find your address and blog I ve lost since a while ,have a nice day !! !! !